If you are looking for effective shotgun ammo for self-defense, this 12ga Express ammo by Remington has the intensity you've been searching for. These 12ga shotshells have a muzzle velocity of 1325 fps, but they are designed to resist over-penetration. 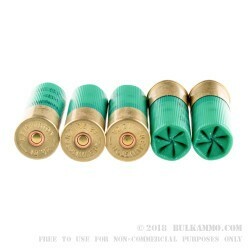 Remington packs 27 pellets of #4 buckshot interspersed with polymer buffer into each 2-3/4" shell. This construction helps create condensed clouds of #4 buck powerful enough to take down a full-grown deer at close range. Remington uses their Power-Piston one-piece wad in this 12ga ammo which helps funnel the pellets into dense patterns. 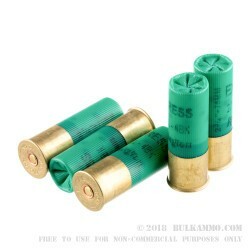 A perfect round for in-home defense, this 12ga ammo is most lethal at short range. Remington ammo is manufactured in the US and has been a mainstay in the American ammo market since the early 1800's. 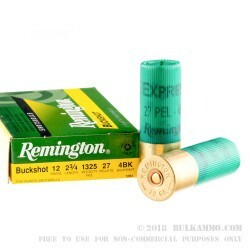 Order your bulk case of this Remington Express 12ga ammo today!